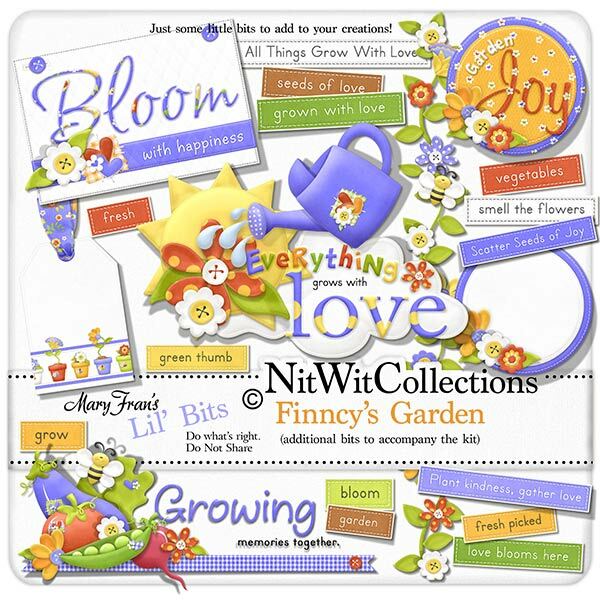 "Finncy's Garden" Lil' Bits is full of all of the wordtags and finished elements for a Vegee Garden themed creation. You can find the Flower themed elements in "Finncy's Flowers" Lil' Bits. Elements in the Lil' Bits are not included in the "Finncy's Garden" FQB. 1 Circle word art - "Garden Joy"
1 Wordart - "Bloom with Happiness"
1 Wordart - "Growing Memories Together"
1 Wordart - "Everything Grows with Love"